Last weekend we packed up the kids and drove to Greenville, SC for the Great Homeschool Convention. We stayed at a hotel with a pool, signed the kids up for the weekend-long VBS that was offered, and invited my parents to attend the conference with us. We were ready to be immersed by “all things home school”. In my mind, this was a family vacation that would encourage us as a family and be the pep rally that we needed to know that we CAN do this. The conference was all of that, and more. There was so much to learn and be exposed to throughout the weekend. Every hour of the three-day conference offered ten different speakers that we could listen to on various topics: parenting, discipline, apologetics, math, reading, science, history, brain differences between boys and girls, etc. The topics were never-ending. During our first session, Tom and I discovered an engaging and very applicable speaker who taught us new parenting tips. The speaker is the founder of Celebrate Calm (that just sounds nice doesn’t it?). This speaker became Tom’s parenting guru – he went to every seminar that this man held all weekend. We even bought his CDs. If we can apply half of what we learned, we will have a calmer and more focused household….the key word being “if”. There was an exhibit hall at the conference as well. It looked like a giant gymnasium filled with every type of curriculum that was ever created. It was very overwhelming. The first time that I walked into the exhibit hall I literally turned around, walked back out and declared myself, “not ready for that!” Eventually I did brave the expo and ended up buying a writing curriculum, getting ideas on how to teach art, and shock of all shockers, deciding to teach my kids Latin. I am still surprised by that one! I left the conference knowing that homeschooling is flexible and every changing. What I don’t like using this year I can replace with something else for next year. It can be ever evolving, to a degree. And the kids, they loved the VBS program! We were going to leave early on Saturday because our brains were full, but the kids wanted to stay until the end. I was also very grateful that my parents were there with us. We couldn’t have done it without them. They allowed us to stay through lunch or later in the day while they took the kids swimming. A hotel with a pool is a must for our family!! I was so inspired by the conference that I may travel to Winston Salem, NC for the conference that is being held there this summer. I would recommend a home school conference to any parent, even someone doesn’t want to home school. A conference can be a great learning experience for parents in general. I have to admit, it was difficult leave the mountain top experience of the conference and be immediately thrown back into our reality (three loud kids in the car for two hours while they bothered each other and whined), but now we have something to aim for. We have begun to apply some of what we learned and it has helped with discipline, attitude, and responses (both mine and the kids’). For example, I am trying to encourage and compliment more than I discipline. For us, the conference cemented in our minds what we want to accomplish and what we want our household to look like and we are slowly moving in that direction. 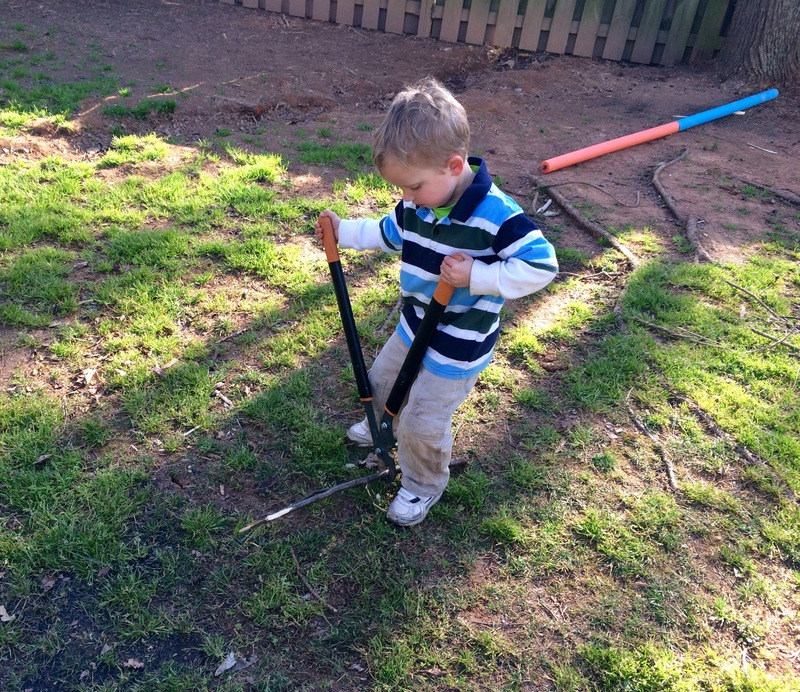 This entry was posted in Uncategorized and tagged conference, greenville, homeschool on March 24, 2016 by Becca. We have truly been enjoying the warmer weather, the sunshine and our new backyard. It is so nice to have a yard that is flat and fenced in. 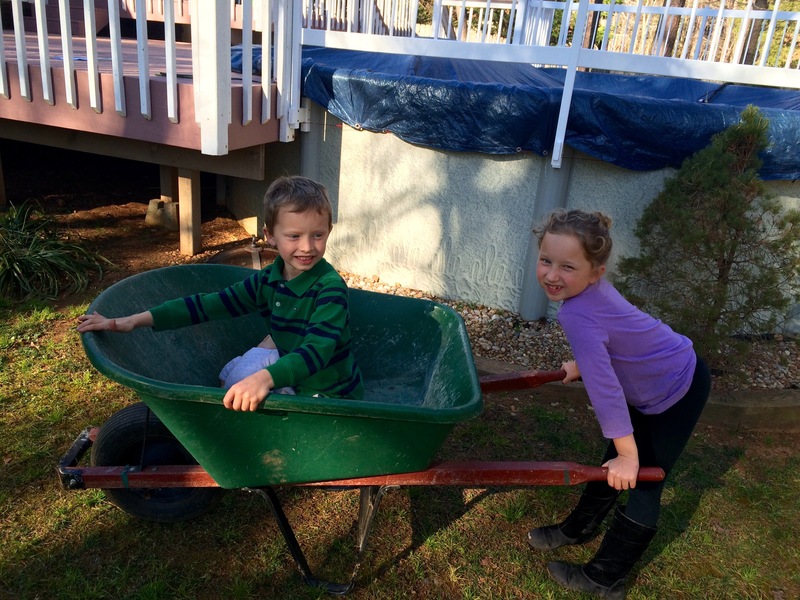 The kids have been collecting firewood, roasting marshmallows, playing survivor, and giving each other rides in the wheelbarrow around the outside of the house. It has been a lot of fun. We have been outside together every day on the weekends and many days during the week. 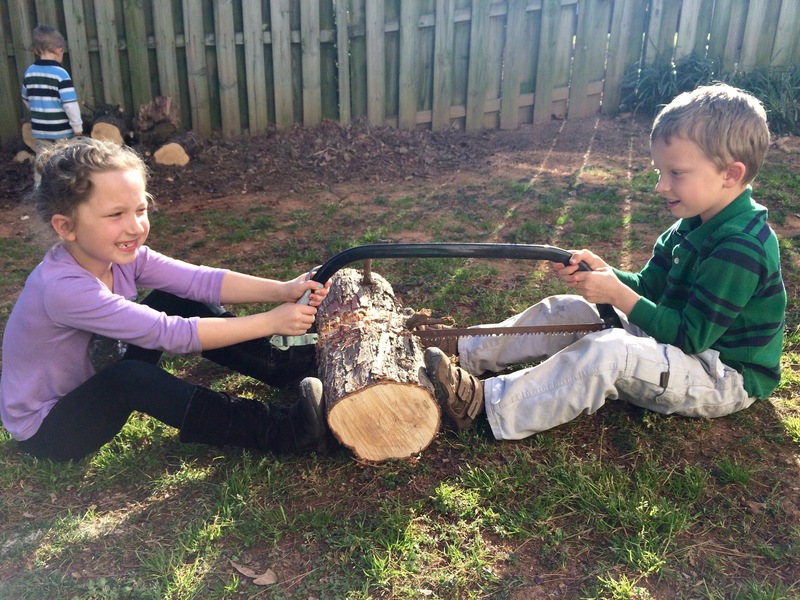 Wilson and Miller came home from school Monday and ran right out into the backyard to play. I love it! As you can see in the pictures, the kids have been busy with some pretty unorthodox “toys”. We taught them some skills first and then gave them some rules. At first, it gave me anxiety to let them play with fire and use sharp tools, but I got used to it. 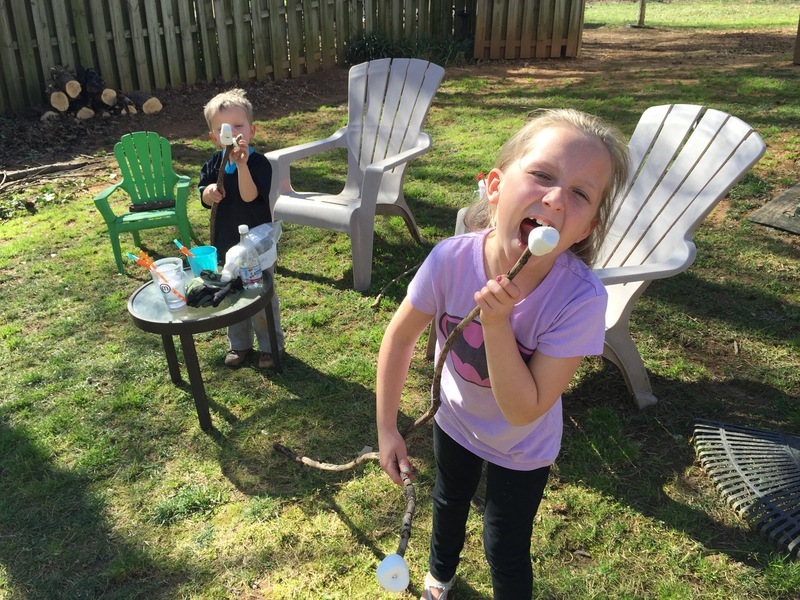 Marshmallow eating (yes, I let them eat them occasionally)…..
Each child has their own stick to light on fire…. Then they decided that small branches weren’t good enough. They needed to cut a pine tree trunk. It took a while but they finally cut it in half…. Miller was in charge of clipping smaller branches…. We have been busy. 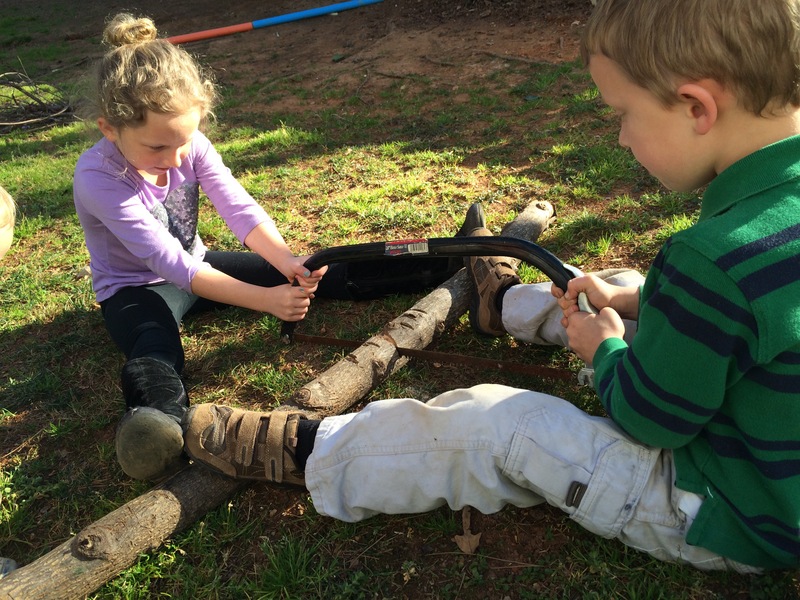 It has been such fun spending our free time outside. The kids got outside, the yard has been cleaned up, and Tom and I have had some time to relax and enjoy life with our family. This entry was posted in Uncategorized on March 11, 2016 by Becca.